Founded in 2004, the Peace Alliance empowers civic engagement toward a culture of peace. It is made up of organizers and advocates throughout the United States taking the work of peacebuilding from the margins of society into the centers of national discourse and policy priorities. Its network includes volunteer grassroots teams in hundreds of cities, towns, colleges and high school campuses. Since its founding, the organization has worked to inspire and empower participation in a grassroots citizen-based campaign to establish a U.S. Department of Peace. The founding of The Peace Alliance marked the first time in history that the Department of Peace was supported by a large grassroots movement, and the founding of Student Peace Alliance in 2006 represented the first student activism behind the legislation. The concept of a Department of Peace dates back to 1935 and has figured in more than 90 pieces of legislation introduced in subsequent years. Today, it is supported by 71 members of the U.S. House of Representatives. Supporting resolutions have been passed by the governing bodies of 35 city, county and other local administrations, including Atlanta, Chicago, Detroit, Los Angeles and San Francisco, representing about 12.5 million people. 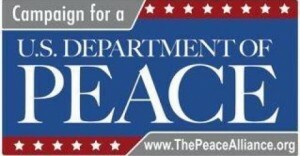 The Department of Peace has been endorsed by 55 organizations, including Amnesty International, NOW and Physicians for Social Responsibility, and has been referred to four committees: House Oversight and Government Reform (Subcommittee on Government Management, Organization, and Procurement), House Foreign Affairs, House Judiciary, and House Education and Labor (Subcommittee on Early Childhood, Elementary, and Secondary Education). The Peace Alliance advocates for evidence-based legislation and policy that will enhance our capacity to reduce violence and build sustainable peace both domestically and internationally. It practices and promotes community peacebuilding efforts that engage people in the day-to-day work of understanding and preventing violence in our homes, communities, and institutions as well as in our personal lives. And it builds broad-based coalitions, educates the public, and generates media in support of its specific policy and community service initiatives.